IAAC Global Summer School (GSS) is testing a distributed educational model seeking to generate a dynamic network based on distributed knowledge and collective actions. IAAC GSS 2011 took simultaneously place in Barcelona (IAAC), Turin and Mumbai (BSSA). Students worked under the same thematic research sharing seminars as well as broadcasted lectures from Barcelona, Mumbai, Turin, New York and Texas. 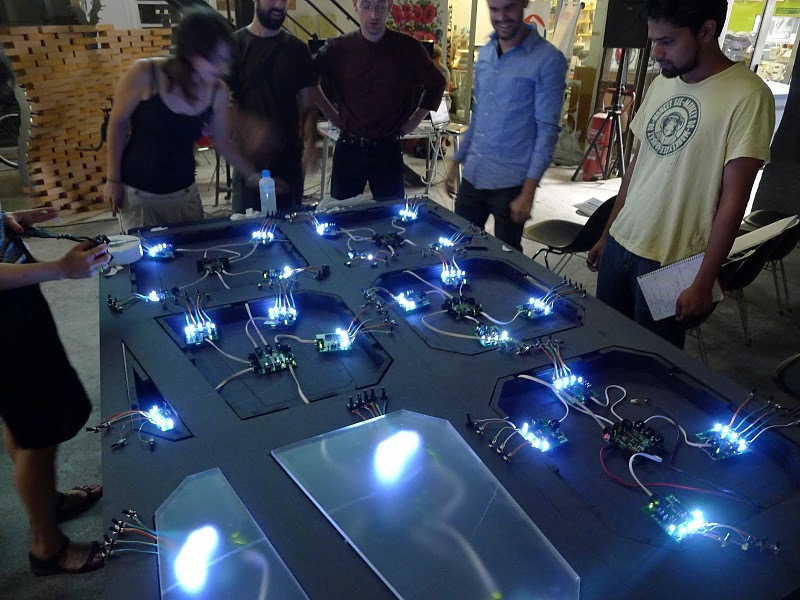 NetworkedCITY is an installation that combines physical computing, data visualization and real time computation by the use of interoperable devices, applications and models. The installation will be based on a physical model of a continuously transformed city and a projection that will allow the visitor to understand the interconnection between the environment that surround us, the energy we consume and produce, the water we consume and the geographical data of our habitat. The aim of the project is to stimulate processes of awareness on visitors, promoting and testing that everything is interconnected, and that networks of people, technology, information and city infrastructure are affecting the way we interact, produce and behave. Throughout the program students worked in collaboration with many experts in the fields of environmental research and information technology including: Urbiotica, Masimo Banzi (Arduino), Usman Haque (Pachube), Thales Alenia Space, Nikos Salingaros, Dhananjay Gadre, Andrew Pane, Carlo Ratti (MIT SENSEable City Lab), Autodesk, McNeel Europe, and more.